This beautiful early 19th century flag descended in the Wales family of Brookline, Massachusetts. The finder of the flag located this flag, along with a 35 star flag from the Civil War period, at the same time. Written on the 35 star flag was the name "George R. Wales, Brookline, Mass." Written on this 13 star flag, which pre-dates the 35 star flag, is the name "John Wales". George Rogers Wales of Brookline was born in 1862 and died 1922. This flag either belonged to George's father, John Wales (b. 1832, d. 1900); his grandfather John Wales (b. 1795, d. 1865); or his great grandfather John Wales (b. 1762, d. 1823). The family history of the Wales family is well documented, with the family patriarch, Nathaniel Wales (b. 1623, d. 1662) being born in York, England and dying in colonial Boston, Massachusetts. 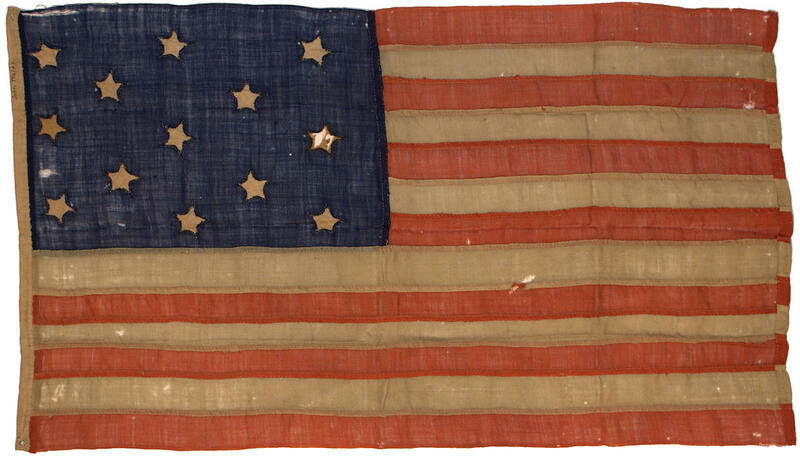 It's difficult to definitively date pre-Civil War 13 star flags, but the construction and style of this special flag leads me to believe that it dates to the period circa 1820-1840, and likely was owned by George's grandfather. The flag is entirely hand stitched, with whip stitched grommets, wool bunting canton and stripes, and single-appliqué cotton stars. This type of construction could date from the period circa 1800 through to the Civil War. A closer examination of the thread used in the flag, to determine its composition and twist, would be necessary to possibly narrow its age further. The flag is especially rare because of its very small size, at just 27 inches on the hoist, 48 inches on the fly. 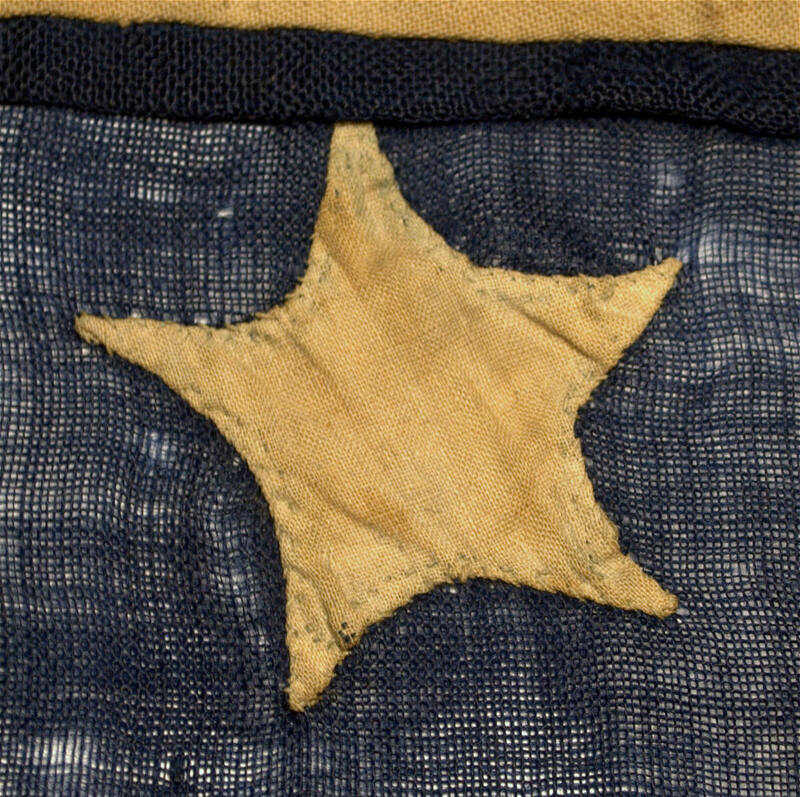 The "finished" side of the flag is typically what we think of as the back of the flag, with the front of the flag showing the details of the single-appliqué work. This is one of my favorite attributes seen on the earliest American flags, because it's such a lost art in flag-making, becoming nearly extinct by the post-Civil War years. 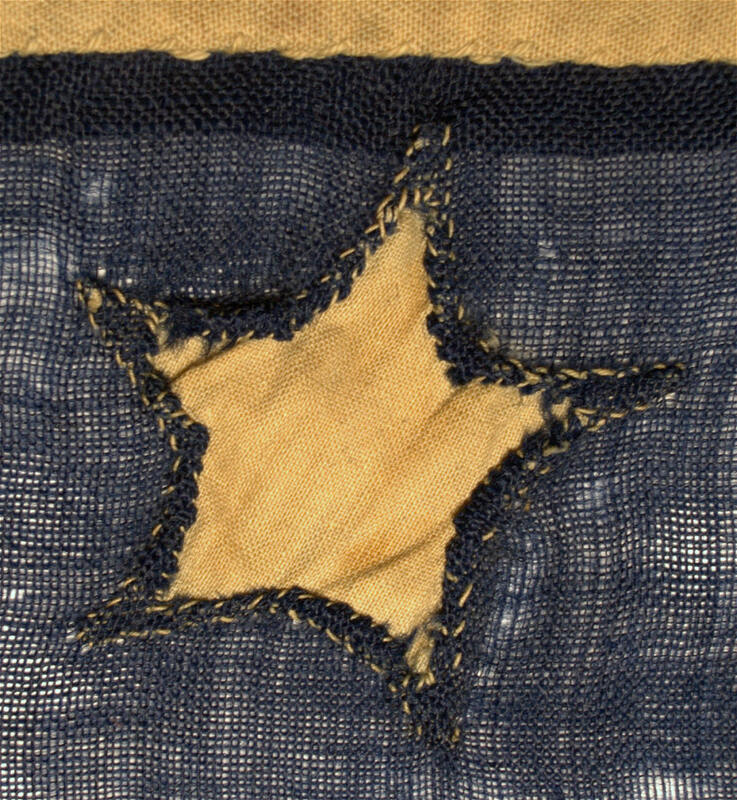 19th century single-appliqué construction. Note the spindly curvature of the arms of the stars. This is an attribute I've most often encountered in the very earliest American flags.